See...I'm still cooking. The recipes are a bit easier, or they're ones I've made in the past. The tried-and-true standbys. Regardless, I came across this recipe in Martha and thought, "that's so easy." I made it and then thought, "That's so easy Benjamin can make it after Anderson arrives." It's true. Simple. I know many of you like simple so here you go. I'll give you Martha's recipe, but say that next time I make this I think some white wine should go in place of the broth- or maybe some wine, some broth. The flavors work really well, but wouldn't white wine just be that much better?! Yes. I also might mix some pasta in there once everything is cooked since the juices are pretty wonderful. It would really help stretch this dish out from serving 4, to maybe serving 6, especially if you add some parm on top of the pasta, and oh, maybe a dab of butter. 1. Heat the broiler and preheat a large ovenproof skillet. Martha prefers cast iron. My cast iron pan isn't that big so I used non-stick. Meanwhile toss tomatoes with beans, capers, garlic, 1 tablespoon oil, and 1/2 teaspoon salt. 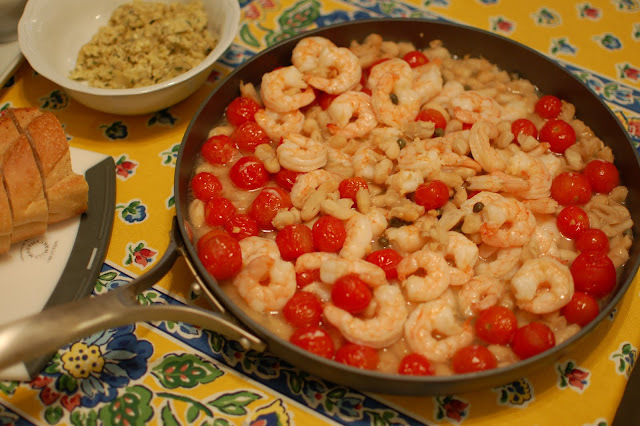 Toss the shrimp with a remaining tablespoon oil and 1/4 teaspoon salt in a separate bowl. 2. 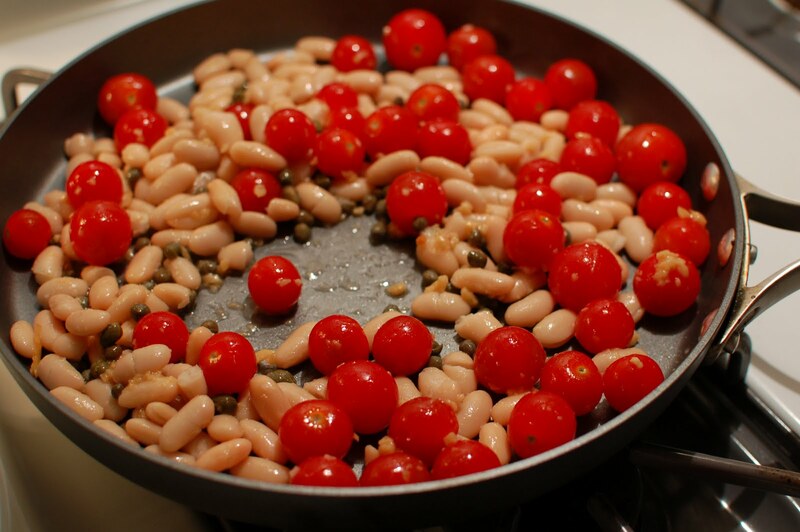 Remove skillet from the oven and add tomato mixture. Broil for 5 minutes until tomatoes are just starting to shrivel. Remove from the oven and stir in the stock (or wine) and shrimp. Broil, stirring halfway, for another 3-5 minutes until shrimp are done. Serve with some crusty bread, or you could make some pasta and throw that in the pan to soak up the wonderful broth and tomato juices. We had bread...next time I'll opt for pasta.